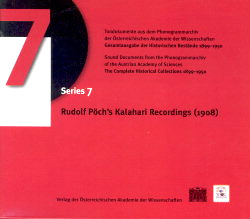 Series 7 comprises the recordings made by Rudolf Pöch in the course of his Kalahari expedition which he started at the end of 1907 on behalf of the Imperial Academy of Sciences in Vienna. His aim was anthropological and ethnographical research amongst the Bushmen of the Kalahari, augmented by botanical, zoological, geographical and geological studies. He stayed there from December 1907 until November 1909. The language recordings are more than valuable in comparative linguistic respects, because they may significantly suggest one or other aspect of linguistic change in Naro. Pöchs music recordings may well represent the oldest sound documents of polyphony of the Khoisan-speaking peoples in the south-west of Africa. Even though several expeditions during the second half of the 20th century succeeded in documenting these styles of music once again, it is to be feared that these polyphonic ways of singing are gradually dying out. This is the second of Pöchs collections assembled by this pioneer in phonographic, photographic and cinematographic field work. His collection from Papua New Guinea (1904–1906) has already been published as Series 3 of the Complete Edition.